Cool! No way do they look the same color. thet are not the same colour alter the pic pu t themside by sade they arent the same, this is a joke. Check it again, if you cut out a section of one of the two squares in a paint program and move it next to the other you will see that they are indeed the same - color #6B6B6B. That's crazy!! I did the paint brush thing and i still dont believe it even after i proved it, lol! Cool, I didn't believe it so I cut and pasted the squares next to each other and they are the same. Its unbelievable but they do seem to be the same colour. The colors are the same. 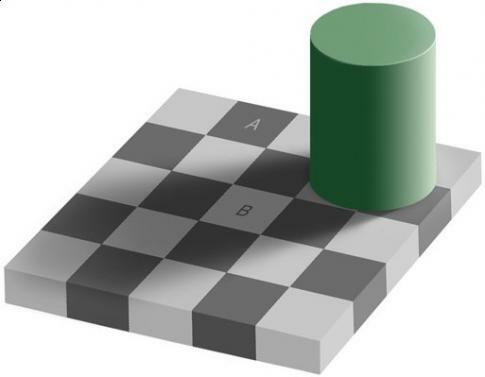 The "B" square is just the invert of the "A" square. they really are the same color!!!!!!!!!!!!!!!!! !